After an oral surgery like tooth extraction or crown lengthening, proper care should be your top priority. If you don’t follow the instructions of your doctor, not only are you more apt to be uncomfortable or in flat out pain – but you can create new problems. Infection and other conditions like dry socket will make you miserable and delay healing of the surgery site. Some swelling is normal after an oral surgery, but you should still take measures to keep it to a minimum so that the muscles in the area can heal. To reduce swelling, use a cold pack on the side of your face where the surgery was done for the first 24 hours. Keeping your head elevated will also help the swelling stay to a minimum. Over the counter medication like ibuprofen can reduce the swelling, but you should only take it if approved by your physician. Contact your doctor if you still see swelling after a week has passed. Bleeding is another common but unfortunate side effect of having oral surgery. Most bleeding should stop within 24 hours, and should only be intermittent and not non-stop. In many cases, the bleeding may stop entirely within a few hours of getting home from the oral surgery. Use the clean gauze provided by your oral surgeon and bite down firmly for at least one full hour. If that doesn’t stop the bleeding, a moist black tea bag may also help you to reduce the bleeding and encourage the site to begin to heal. Be careful when you brush your teeth, chew food, and floss in the days following your surgery. If you are not mindful, you can cause trauma to the site and bring on new bleeding or accidentally rip out stitches. Every patient will experience a different level of pain after an oral surgery. The pain may be dull and easily managed, or you may experience some severe discomfort that requires the intervention of medication. Keep in mind that the muscles near the surgical area may get sight or experience some soreness as well as the actual gum line where the surgery took place. With the help of your surgeon, you can plan for pain ahead of time and find out which medications are best for your particular situation. Anything that thins the blood should generally be avoided immediately following your surgery. Oral surgery requires after care to prevent infection or increased bleeding. While you may be numb for a while after the surgery, don’t resume your normal eating or smoking habits as if you didn’t just have a procedure. 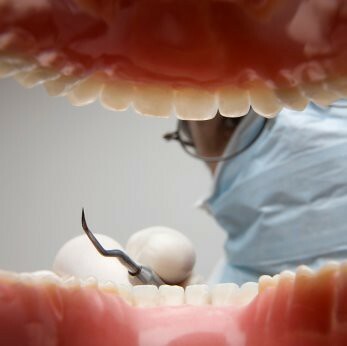 In the short term you may cause trauma to the surgical site, and in the long run you may have serious problems with healing or even need additional work to get the gums to properly heal. Steve Gott is a former dentist and grandfather of seven. He now spends his days with his grandkids, and his nights blogging on the Internet. He recommends Dental implant clinics operating in states like California, Virginia, New Jersey that use the latest technologies to ensure patient comfort and recovery.